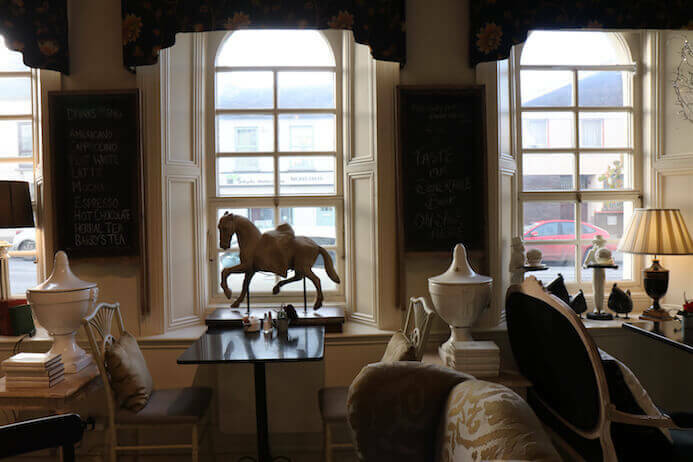 This Cafe Townhouse Doneraile review is part of a series of posts from my Munster Vales travel guide. Disclaimer: this was a complimentary meal as part of my tour around Munster Vales. I was not required or asked to write a review, however, I decided to do so as it was so impressive. Standing proudly on Doneraile Main Street is a beautifully restored three-story Georgian building that has been there since the 1870s. 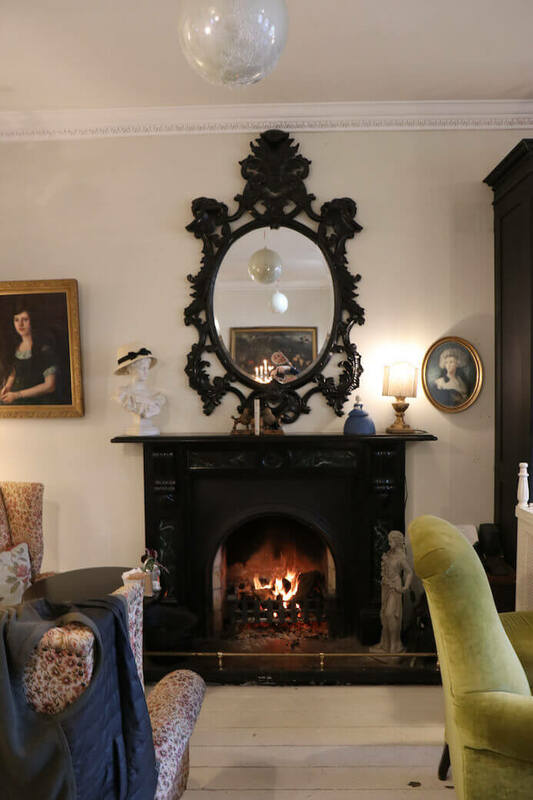 It used to be the old Commercial Hall but now it is home to Myra and Ray and their interiors business and the charming Cafe Townhouse Doneraile. The building’s exterior is immaculate. A discrete ‘illy’ coffee sign and small table and chairs hint at what lies through the tree-lined doorway. 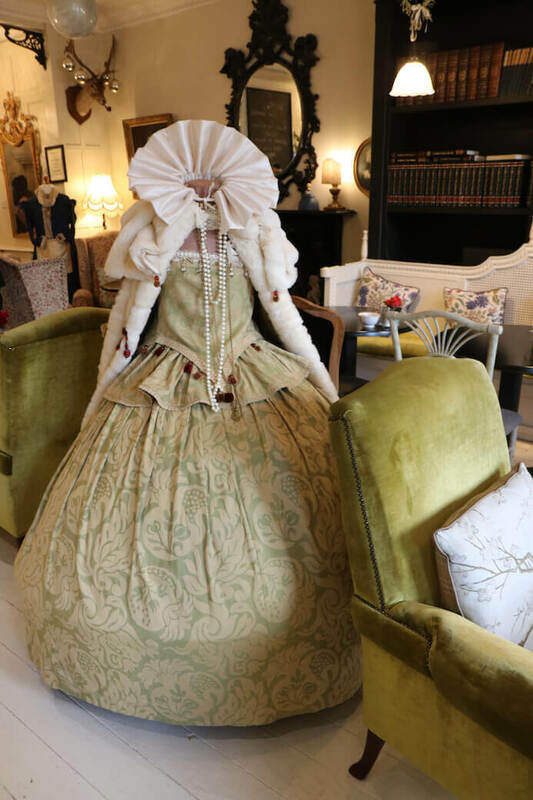 I walked into Cafe Townhouse Doneraile and I was immediately brought back in time to the grandeur of another era. The café is exactly how I imagine a Victorian-era drawing-room or French tea room would look. It just exudes elegance with its exquisite décor and lavish furnishings. The high-ceilinged room is bright and airy thanks to three large windows which fill the room with natural light. A dark wooden bookcase stretches across one wall and is filled with encyclopaedias, leather-bound book collections and tea sets. In front of that is an elegant cushioned-filled white wooden bench with three round tables. All the tables in the cafe are made of the same dark wood but the seats are a mixture of high-back armchairs, sumptuous upholstered sofas and antique wooden dining chairs. There are no plastic or metal furnishings here. 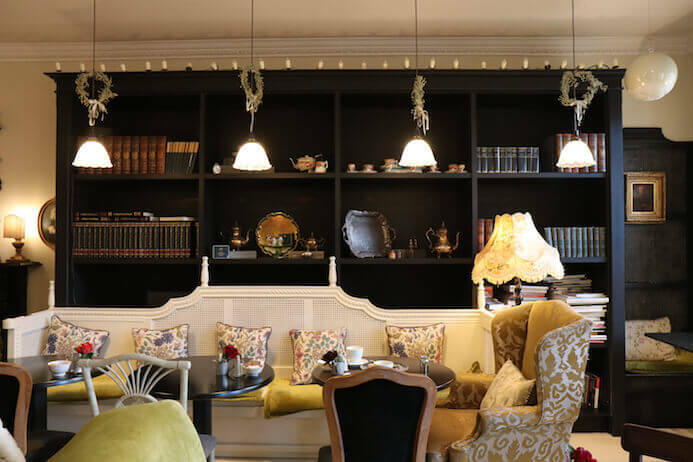 Cafe Townhouse Doneraile is pure luxury. As a result, the place feels very relaxing and the antique fireplace with its blazing open fire begs you to settle down in front of it with a good book. The classical music unobtrusively playing in the background adds to the chilled-out vibe as does the soft lighting. Everything in the room; the wallpaper, the artwork, the chandeliers, the flooring, the antique mirrors, the ornaments all come together to tell a tale, set the scene and create a charming, magical atmosphere. You can immediately see why Cafe Townhouse Doneraile was voted ‘Most Stylish Cafe’ in the 2017 New Yorker Hi Style Awards – “Munster’s largest and most prestigious style awards event”. The cafe serves another purpose, to showcase the talents of Myra and Ray who chose all the fabrics, made all the curtains, blinds and cushions and decorated the room. Every item is period correct (if it isn’t I can’t tell), there’s even a handmade (by Myra) period costume in the middle of the cafe. The duo is clearly very proud of their work, and they should be. They have really created something special. I’ve gone on so much about the interior of Cafe Townhouse Doneraile because it really did impress me. This is one of the prettiest, original, photographic cafes I have ever visited in Ireland. OK, I’ll stop waxing lyrical now about the décor of Cafe Townhouse Doneraile and you can have a look at the photos for yourself. Cafe Townhouse Doneraile serves hot and cold breakfast and brunch dishes and a lunch menu of sandwiches, tarts, salads and soups. But my eye was drawn to the cakes on the counter. They are the type of cakes you want to bury your face in! 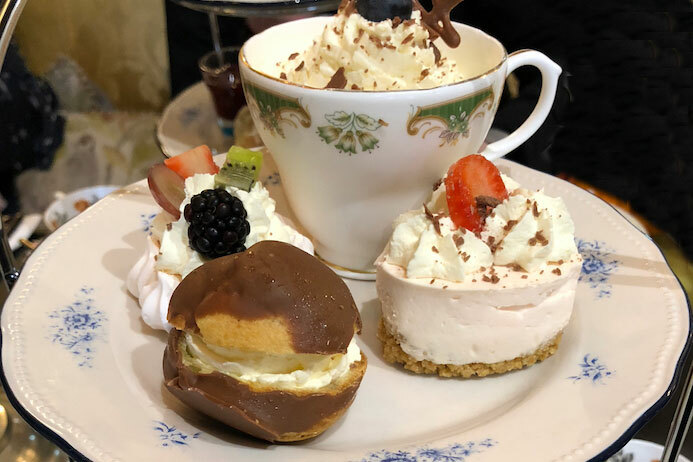 All the food in Cafe Townhouse Doneraile is made in-house and there is a very talented full-time pâtissier in the kitchen baking the scrumptious sweet treats. 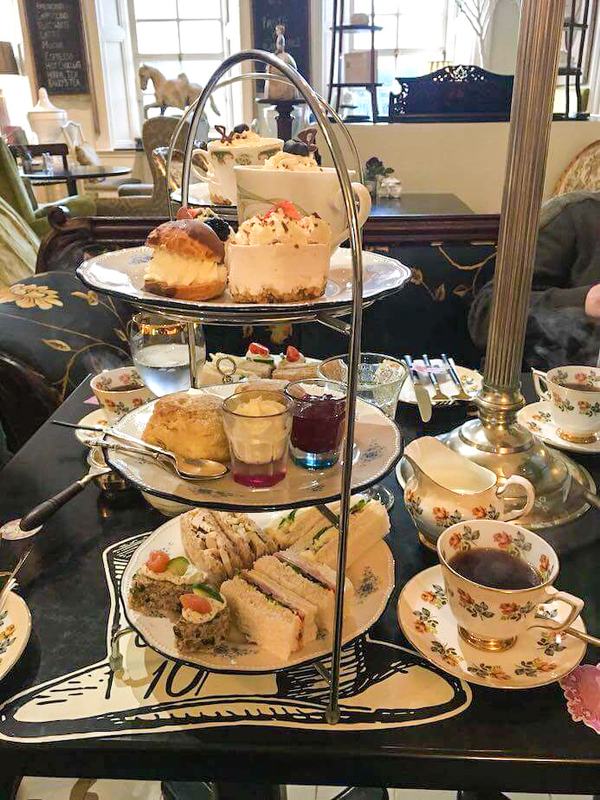 On this occasion, we were indulging in afternoon tea in Cafe Townhouse Doneraile. 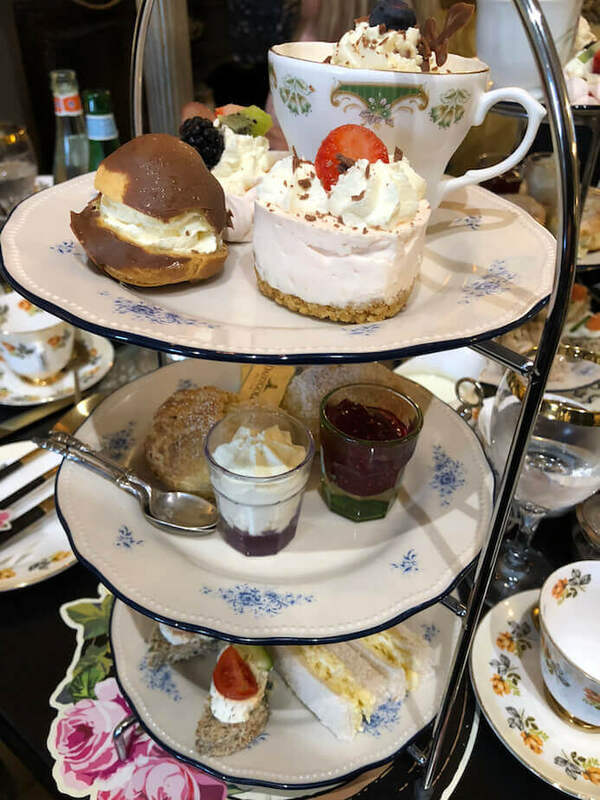 The room is the perfect setting for afternoon tea but if there is six or more of you dining you can take afternoon tea in the fabulous ‘botanical’ private dining room upstairs. In the warmer months, you can enjoy a side of sunshine with your sarnies in the secluded walled garden of Café Townhouse Doneraile. I do love afternoon tea. Eating your way through tiers of delicate food whilst copious cups of coffee (or tea or champagne) are poured by attentive servers is very decadent. But enjoying it in such a remarkable setting as Cafe Townhouse Doneraile just adds to the specialness of it. 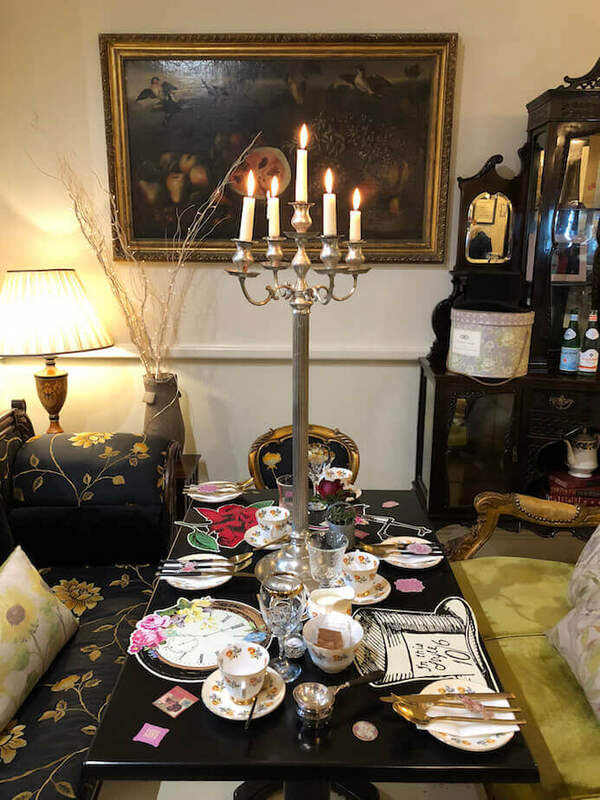 A saporous range of exquisitely presented savouries and sweets is served to us on three-tier cake stands and silver teaspoons tinkle against fine china teacups. On the table was a traditional afternoon tea, a vegetarian afternoon tea and a gluten-free afternoon tea. Myra and Ray will do their best to cater to your personal dietary requirements. As is tradition, we started with the savoury tier. Classic finger sandwiches made with soft white and brown bread were filled with local cheese, creamy egg mayonnaise (free range of course), delicate cucumber, baked Irish ham, chicken breast and smoked salmon. The sandwiches were delicate and light, exactly what you want when saving room for two tiers of sweet stuff, as I was. The sandwiches were remarkably fresh, not a curled corner in sight, and it was a real pleasure to be eating such thoughtfully sourced ingredients. We then started on the sweet tiers. 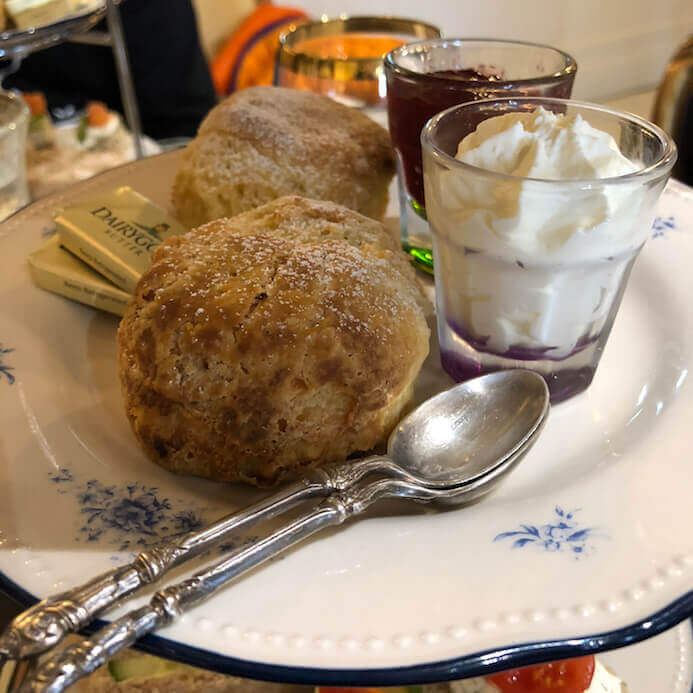 I headed straight for the light, warm and buttery scones that came with slightly sweetened fresh whipped cream and raspberry jam. I tried to ignore the two shiny gold pats of butter on the pretty plate, but I couldn’t. It is my pet peeve. I would have loved if the butter was served in a little dish on the side or served any other way other than in its foil envelope. The scones were fluffy and the perfect texture for smearing with lots of jam. Ok lots of cream too, don’t judge me. The top-tier was, for me, the most tempting. I tried to sample as much as I could, for research purposes, of course. I started with the teacup of lemon posset, one of my all-time favourites. 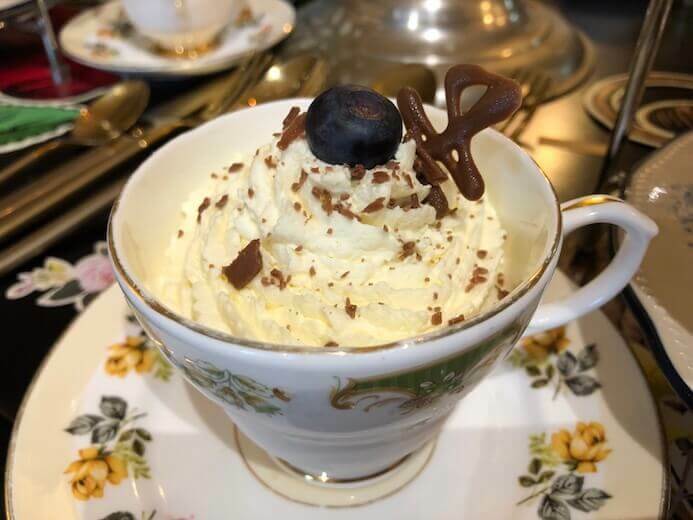 It was topped with fresh cream, a fresh blueberry, chocolate shavings and a chocolate filigree. The texture was thick and velvety, and the zesty lemon flavour was balanced out by the whipped cream. The heart-shaped strawberry cheesecake melted in my mouth. The buttery biscuit base provided a lovely contrasting texture to the silky filling. The meringue nest had a lovely marshmallow-like texture. It was filled with fresh cream and fresh fruit – a blackberry, kiwi, red grape and strawberry. There was a lovely balance of sweet and tart flavours and creamy and crunchy textures. The choux bun was light, airy and crispy. It was piped full of fresh cream and topped a generous amount of milk chocolate. For me, too much sugar is never enough. So I also sampled from the gluten-free afternoon tea. I tried the towering slice of Victoria sponge with strawberry jam and cream. It didn’t have the same airy, springy texture as a regular sponge cake. It was more like a Madeira cake. But it did taste great with those classic flavours really coming through. The gluten-free Victoria sponge did me in and I had no more room for any more food. My sweet tooth was duly satisfied. The afternoon tea was scrumptious. Everything was very well-balanced and each tier complimented the last. My only criticism is a very personal one. I’m not a big fan of cream and every delicacy on the top-tier contained fresh cream. When I go again, and I will go again, I’ll ask for the lemon posset and cheesecake without the cream. The afternoon tea is €25 per person. Given the quality of food, service and splendid surroundings this is exceptionally good value. Myra and Ray have a great eye for design and are warm and welcoming hosts. But it’s not all style over substance. The food is also a real draw. The seasonal menu features locally sourced ingredients cooked and served with care and attention. There is a real sense of pride at Cafe Townhouse Doneraile. It shines through everything from the presentation of the food, the effort put into the surroundings to the friendly service. Overall, Cafe Townhouse Doneraile is one of the nicest cafes I have ever visited. Furthermore, the afternoon tea is one of the best value afternoon teas that I have ever had in Ireland. When you go, make sure your phone has plenty of battery as you’ll want to take loads of photos. Thanks to Tríona O’Mahony of Munster Vales and Myra Ryall and Ray O’Callaghan for organising our Cafe Townhouse Doneraile visit. 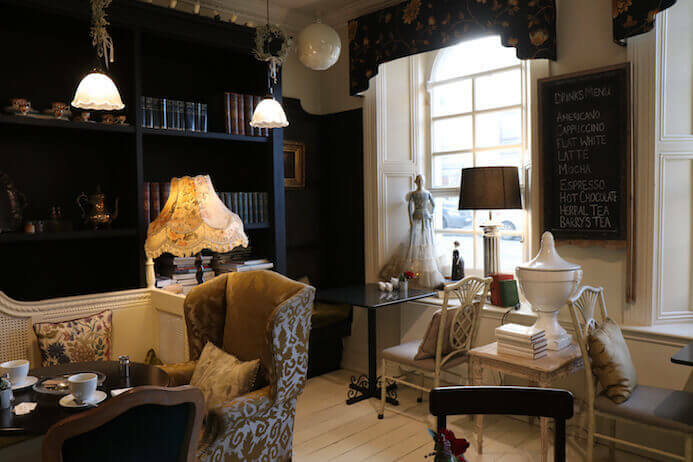 Do you have a Cafe Townhouse Doneraile review? Let me know and I’ll link to it from this blog. 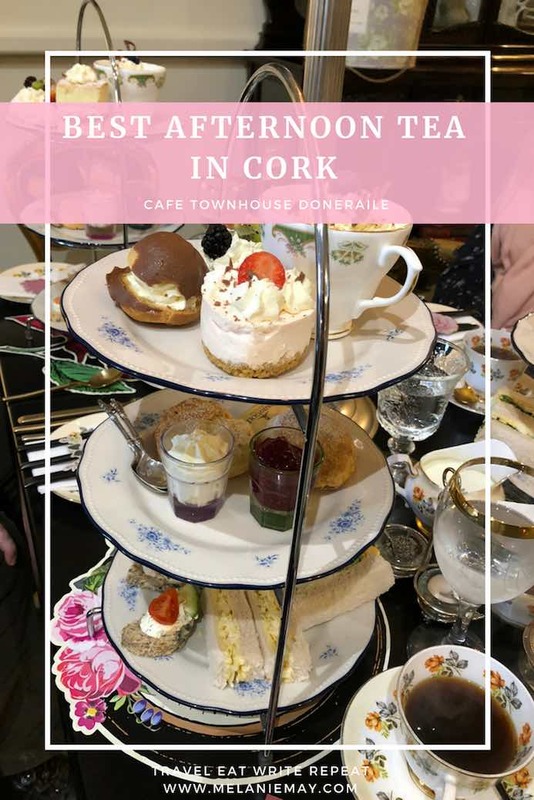 Have you been to Cafe Townhouse Doneraile? 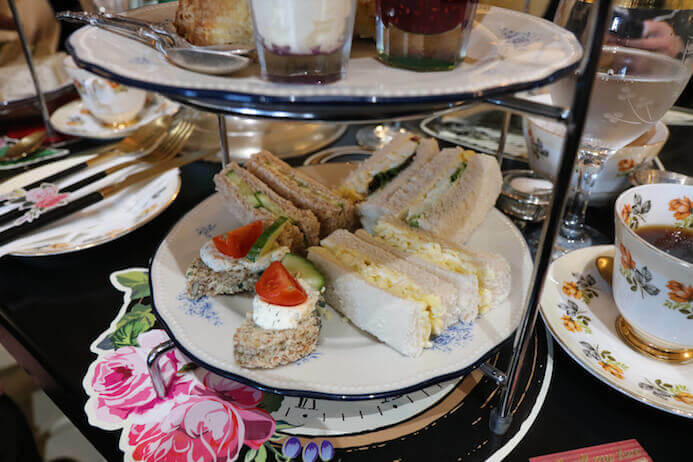 Did you try the afternoon tea in Cafe Townhouse Doneraile? Let me know if you did. I love hearing from you. 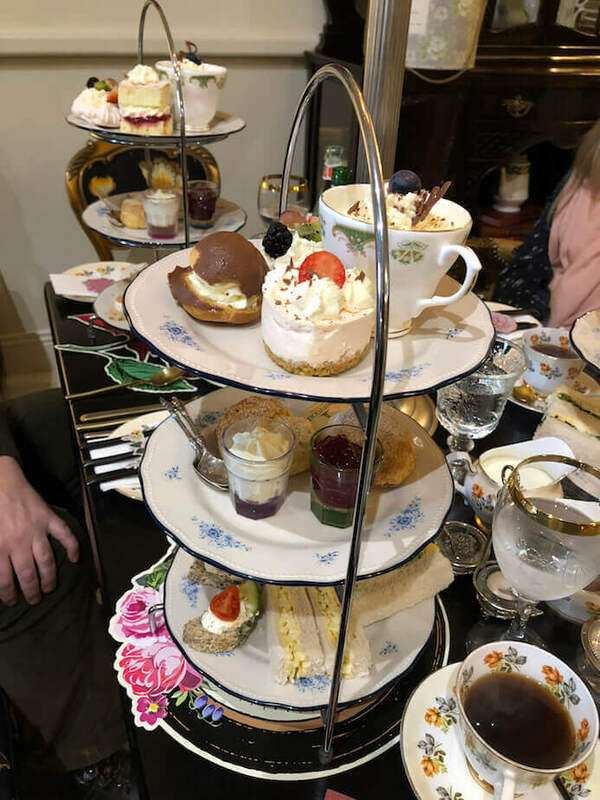 If you liked this Cafe Townhouse Doneraile review, you might also like my review of the Finn Lough Bubble Domes in Northern Ireland. Read my list of five-star Dublin hotels with afternoon tea. You might also like my review of the Orient Express Pullman Restaurant in Galway, Ireland. Finally, you might also like my review of the Abbeyglen Castle Hotel in Galway, Ireland. 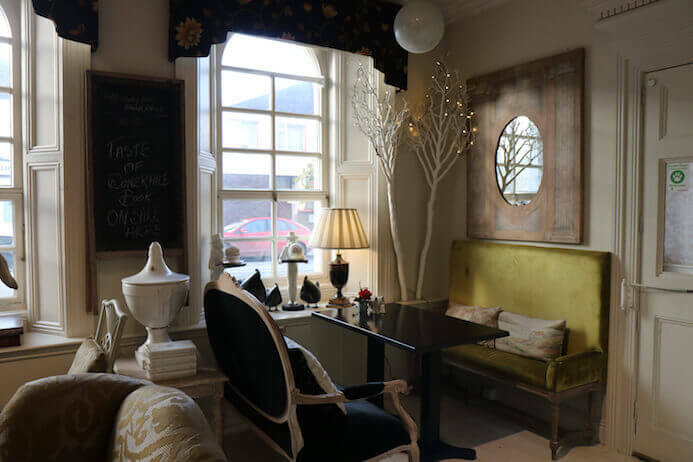 If you liked this Cafe Townhouse Doneraile review, please share with others.